As an astrology-based luxury timepiece and jewelry line, SEAH will be releasing a new watch collection next week at the JA New York Winter Show. The new collection will include three men’s and two women’s timepiece model, and add to SEAH’s very successful Sun Collection. The luxury watch collection is fully patented and the world’s only one that replaces the standard numeric dial with twelve Greek zodiac signs. Each watch piece is Swiss made. The leading quartz movement and personalized rotating bezel provides a way for the watch owner to position the marker to point to their own personal zodiac sign. The Astronomer: Comes in three different men’s models. The black version includes a 46mm case, 10 ATM water resistance and is made of stainless steel plus a black enamel rotating bezel with diamond dust textured detail at each hour marker. At the 12 o’clock marker position is a satin metal star on diamond dust. The watch’s rotating bezel can be rotated allowing the star to be pointed towards the the wearer’s astrological sign. Greek zodiac signs replace the hour markers and are offset against a black lacquer watch face. The seconds hand of The Astronomer luxury watch comes in red as well as the stitching on the Austrian Hirsch black leather strap. The Suggested Retail Price of The Astronomer luxury watch is $695.00 and includes two straps. The Celestial: Available in two women’s watch models. It’s made of stainless steel and features gorgeous 18 karat gold plating, in addition to a mother-of-pearl face. It is 42mm in size 10 ATM water resistance, which is noted on the watch case back. The calendar marker of The Celestial is found at the four o’clock hour position. The Greek zodiac signs beautifully denote each number position in diamond dust. At the dial center is a stylish golden lace sun that blazes at twelve o’clock and is also made in diamond dust. The new SEAH women’s watch comes with a rotating bezel and markers with Diamond dust to show the wearer’s personal astrological sign. The Suggested Retail Price of The Celestial luxury watch is between $1,000 and $1,200 and includes two straps. 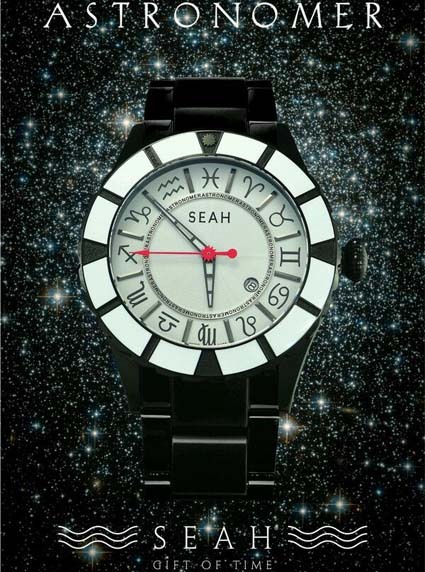 This new watch collection from SEAH can be found online at www.SEAHdesigns.com or at major retailers worldwide. If you are interested in buying a new luxury watch, please contact The Life of Luxury and we can help with your purchase.